A quick round-up of this year’s garden successes, as the summer growing season comes to a close and I start thinking about autumn planting. Garlic! No photo, but I got between 12 and 15 garlic bulbs, all of which are tasty and fairly easy to peel. That’s 4-5 weeks of our garlic supply, which is great. (We use a lot of garlic.) I will definitely be putting more in in November. 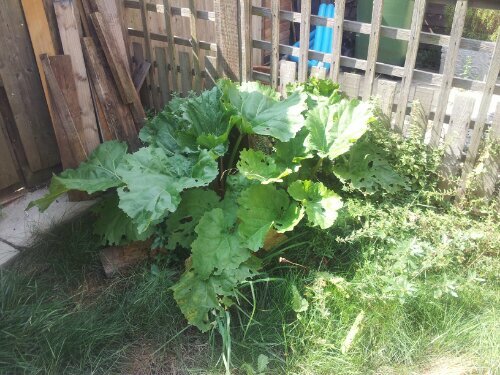 The rhubarb I transplanted from the allotment has settled in fine, despite being transplanted at totally the wrong time of year. No harvest this year as I’ve been letting it gather its strength, but looking forward to rhubarb crumble and rhubarb jam next year. 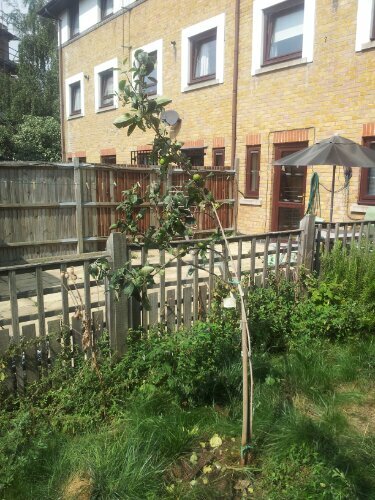 The apple tree is doing very well, despite some concerns with the ants earlier in the year, and we should have a good dozen apples this year, assuming they keep growing and no further problems. It needs a good prune over the winter. The tomatoes are doing wonderfully. I’ve just started harvesting the first few this week, and they taste great. I have about 50% large (which will mostly be cooked down into passata) and 50% cherry (which will mostly be eaten straight off the vine). 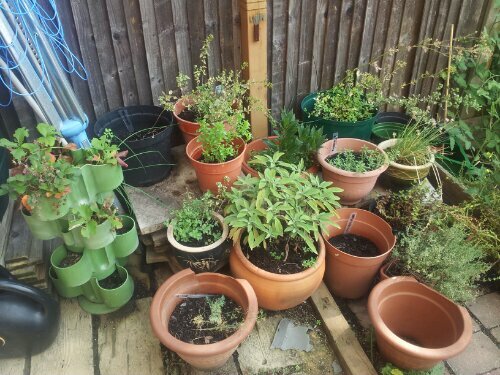 The ones in the self-watering containers have once again done best, so plan for next year is to make a few more self-watering containers. The herb garden has mostly done pretty well. I still think it’s a little underutilised (not all of my pots have been filled). The basil struggled a lot, which I think might be a snail problem (see the problems post for more on snails. 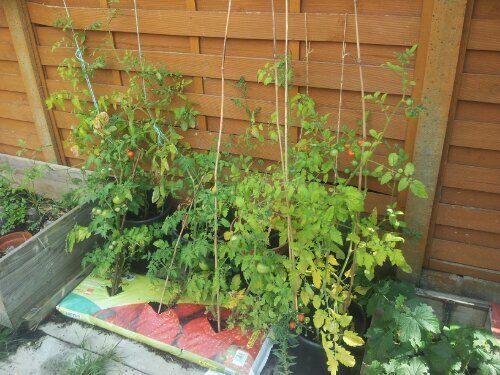 Main plans for next year: plant more basil and coriander, deal with snails in some way, find a way of reminding other cooks in the house that the fresh herbs are there. We have all of the rocket in the world (this is just one of the many rocket jungles, some of which emerge from cracks in the paving slabs), mostly self-seeded. The bees like it too. The only issue is that we’re not eating that much of it; I need to think about harvesting strategies for next year. However, as weeds go, I’ll take rocket over most things. This all self-seeded, I think. It’s doing great. 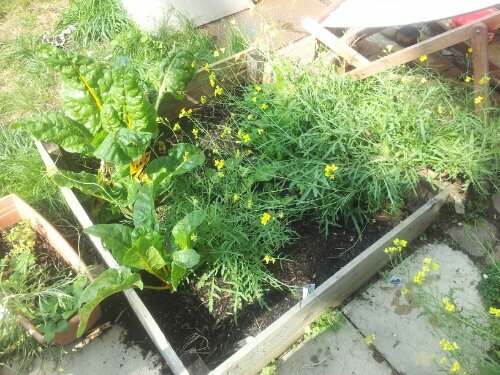 The chard is also doing very well (note also more rocket). I think this lot self-seeded, but I might have planted it. I eat chard quite regularly, so it is being eaten. The thing I note from this is that it’s the low-maintenance and self-seeded plants that seem to be doing the best. Something to bear in mind when planning for next year. Make more SWCs for tomatoes. Plant more basil and coriander. Busy times over here, with Leon starting to walk and lots of summer fun stuff happening. I’ve harvested my garlic, and for the first time ever got a really decent crop (14 bulbs) which look like they’ll be very usable. Unfortunately I left it a week too late and the stalks are too dry to be plaited and hung to dry, so the bulbs are drying on a plate in the kitchen and being turned occasionally. I planted these garlics from a bulb (sold for eating) from the Co-op rather than buying proper seed garlic and they’re my best ever, and I’m not quite sure what to think! I’m debating whether I should save a bulb for next year (usually discouraged I think if you’ve planted supermarket seed? ), buy another Co-op bulb next year, or buy a ‘proper’ one. Depressingly, though, my grape vine has died altogether. 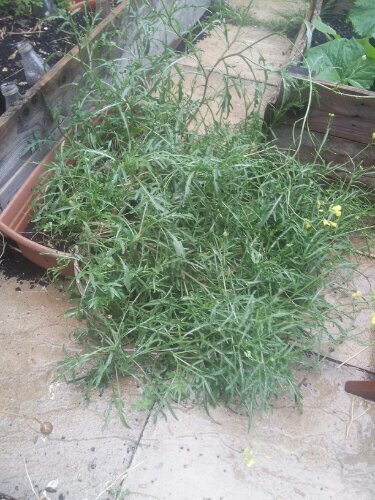 It got heavily munched by snails/slugs, but when I wrote to the nursery they thought it would recover. Sadly not. I am probably going to try again next year, but in the meantime I need a plan of action for dealing with the slimey beasties. I’ve also started work on my Permaculture Diploma, which is exciting. I’m using the Back Garden Project as one of my designs, so have been pulling posts together from that and writing up my analysis more formally. Other projects on the horizon include a mini greenhouse for the back garden, a plan for the balcony and the front porch, and very excitingly, a plan for my friends’ new allotment. I’ve also been writing about mastitis with an older baby over at Natural Parents Network, for World Breastfeeding Week.